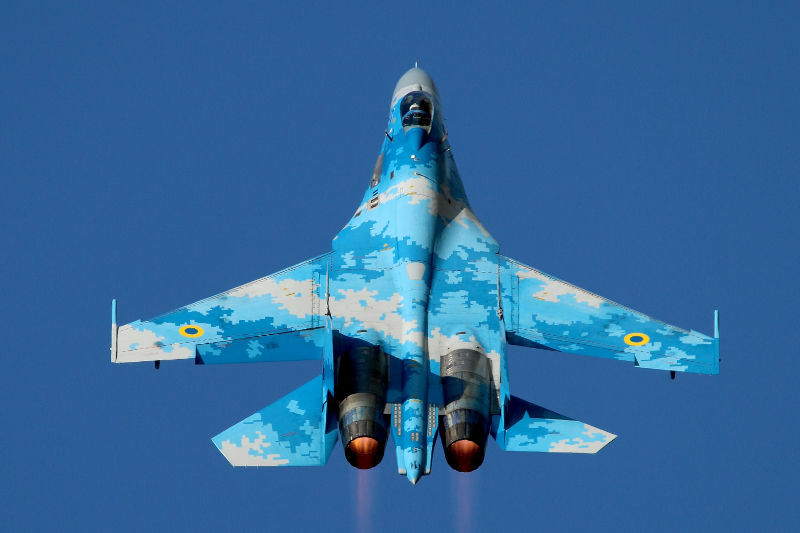 One of the stars of last year’s airshow, a Russian-built Sukhoi Su-27 from the Ukrainian Air Force, is set to grace the skies above RAF Fairford once more in a thrilling flying display at 2019’s Royal International Air Tattoo. The Soviet-era heavy fighter was initially created in reaction to the United States Air Force’s F-15 Eagle. The Sukhoi design, which was the first Soviet aircraft to be operated using an electronic interface instead of conventional manual flight controls, is an exceptionally agile aircraft that can reach top speeds of 2,500 km/h. Codenamed ‘Flanker’ by the North Atlantic Treaty Organisation (NATO), it first flew in 1977, and was much feared by potential Western opponents during the Cold War. Since the collapse of the USSR in 1991, the original Su-27 series has continued to equip the Russian armed forces and serve with the Ukrainian Air Force, which we are excited to be welcoming back to the Air Tattoo this July. Also delighting visitors with their thrilling flying displays will be the RAF Red Arrows, the Battle of Britain Memorial Flight and the rarely seen Spanish Navy Harriers. On the ground, visitors will be able to marvel at large transports like the Ukrainian Il-76 ‘Candid’, attending in support of the Su-27, the Royal Jordanian Air Force C-130H Hercules and the US Air Force’s C-17 Globemaster III, to name a few. The Summer Time Advanced Aerospace Residency (STAAR) class of 2019 has been selected from a record breaking number of applications from students across England, Scotland and Wales. This summer, sixty Year 10 students aged 14-15 will participate in two, week long residentials that will see recruits experiencing life as an aerospace engineer, where they will live, work, learn and solve tasks together! Over 260 students applied for the 60 places available for this year’s summer camp which offers a unique insight into the exciting world of aerospace for youngsters interested in future careers in STEM related fields. Prior to selection, applications were verified ensuring students met the criteria and then placed into a random draw of girls and boys for week 1 and week 2. The draw took place on board the VC10 aircraft by representatives of the organisations who help deliver the programme. STAAR is fully funded by the global aerospace and defence technology giant, Northrop Grumman, with the support of the Northrop Grumman Foundation in partnership with the Royal Air Force Museum. 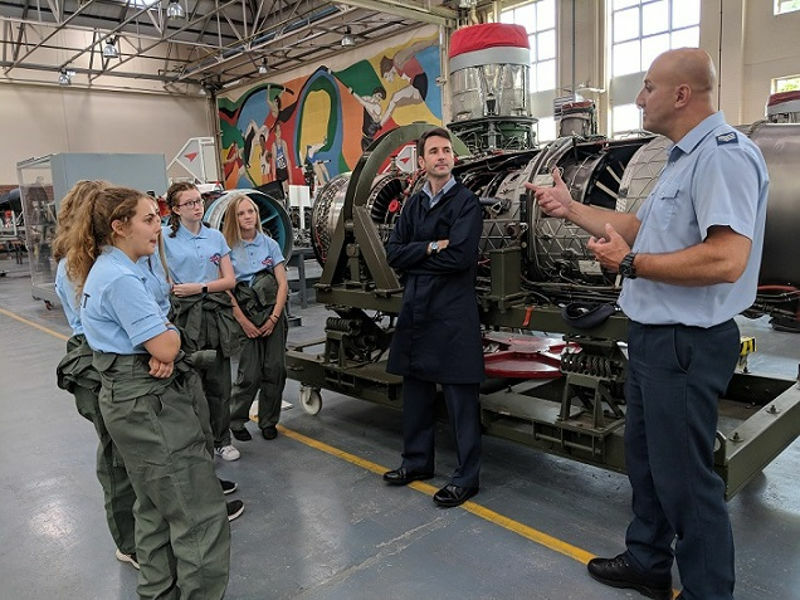 The residential weeks will accommodate 30 students per week and is delivered by the RAF Museum, Royal Air Force Cosford, RAF Youth and STEM Engagement Team and Tablet Academy. 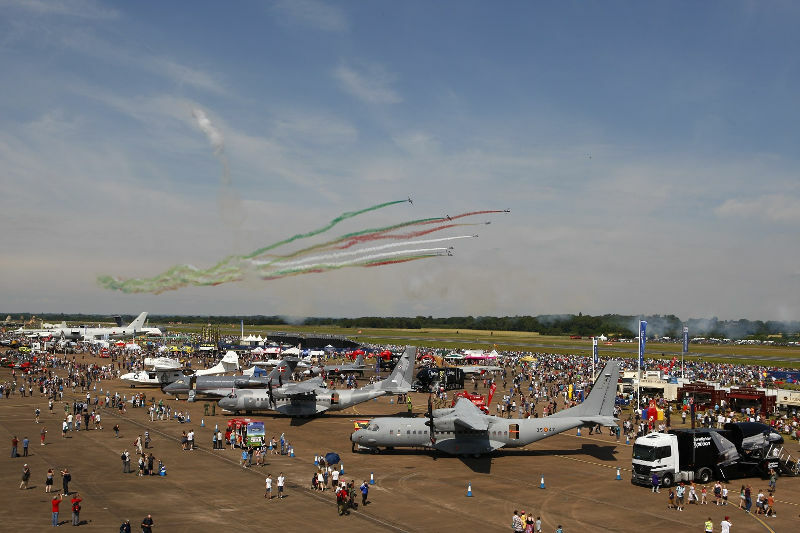 The class of 2019 will be invited to attend the RAF Cosford Air Show on 9 June, where they will have the opportunity to meet with fellow recruits, STAAR partners and enjoy a day viewing the very pinnacle of the aerospace industry. Recruits will also be handed their starter packs and kit ready to start the residential week on 22-26 July and 29 July-2 August 2019. For more information on the STAAR programme visit www.rafmuseum.org/STAAR. 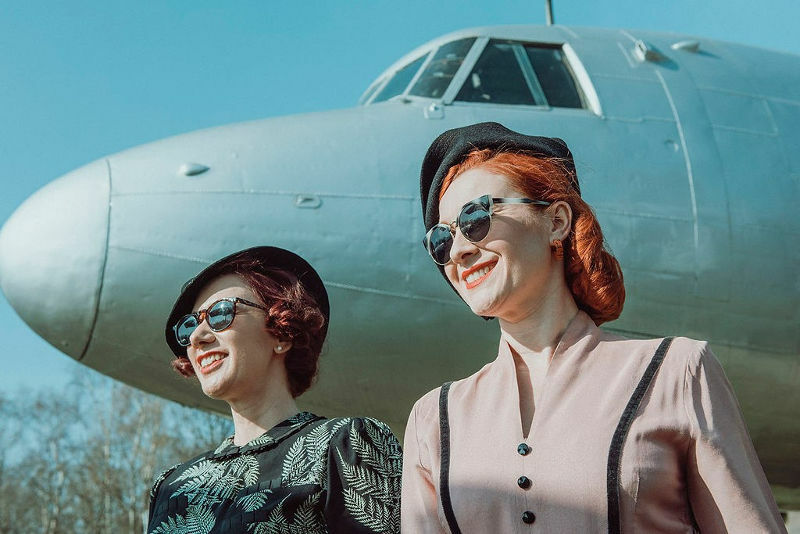 The public are urged to dress up in vintage style, step back in time and immerse themselves in nostalgia well into the evening at Brooklands Museum’s annual homage to the 1940s, ‘50s and ‘60s on Saturday 18th May. Live period music in the dance marquee, aircraft and vehicle displays and a well-stocked trade village will mean an unmissable day as the 32 acre site brings together the fashion, music, dancing and vehicles from these great post-war decades of style. In the dance marquee will be a rolling programme of live music, DJs and FREE dance classes while outside, under the Race Bays will be traders selling everything from clothing and records to homewares, books and magazines. Any ladies wishing to refine their look should head to the Press Hut as a vintage-style hair and make-up parlour will be set up courtesy of Hair That Turns Heads – a troupe of stylists who specialise in recreating the looks and styles from the period. Due to the high demand on the day, they are already taking appointments in advance. To discuss a booking, speak with the team directly on: 07733 383 735 or e-mail: lucy@hairthatturnsheads.co.uk. Displays of vehicles will include saloons, tourers, vans, motorcycles, hot rods and military which will fill the Paddock, Motoring Village and surrounding areas along with re-enactor groups portraying everything from the Home Guard, RAF and Land Army Girls to civilian and family life adding to the ‘time travelling’ effect. In the skies, the organisers are planning fly-ins of period aircraft*. These will land on the airstrip opposite the Museum entrance at Mercedes-Benz World and visitors will be able to see them up close and meet the pilots. Special guests on the day include the Vintage Tourists, a couple of globe-trotting gals who write about the very finest places to visit all with a vintage twist. They have been tasked with scouting the site for the best-dressed man and lady at this year’s event which culminates in a prize-giving ceremony in the marquee in front of eager crowds. Also making an appearance will be Studio Harlow: specialising in Hollywood style portraits, they will be setting up a free portrait studio in the Art Deco surroundings of the Ladies Reading Room in the Clubhouse. This will give visitors a chance to capture their inner film star and provide a memorable keepsake of their day. Brooklands was the world’s first purpose-built motor racing venue which retains its 1930s appearance and buildings so is a perfect venue for such a nostalgic event as this. As well as the motoring heritage, aircraft production and flying which took place at Brooklands over an 80 year period can be fully explored by visitors as their entry ticket includes access to the incredible Award-Winning Aircraft Factory. Inside, full size sections of aircraft are displayed on ‘assembly lines’ and visitors can try some of the tooling and manufacturing skills used by workers through specially-designed interactive work stations. The centre piece in the factory is ‘R for Robert’, the Brooklands WW2 Wellington Bomber surrounded by artefacts that tell the incredible stories during this period and ‘meet’ some of the pilots, engineers and 14,000 workforce that made Brooklands one of the most productive aviation sites in Europe. All the aircraft, racing car and motorcycle exhibition areas at the Museum will be open as usual from 10am until 5pm. However, the music and dancing will continue in the marquee until 9pm with a bar and catering to keep visitors sustained. There will be a Family Activity Zone led by the Brooklands Learning Team where children can make their own traditional toy to take home. FREE parking will be available, just follow the event signage on the day. Tickets are available in advance at a discounted rate or on the day: Adults £14.50/£16, Seniors £13.50/£15, Children (5-16 yrs) £8/£9, Family ticket (2 adults and up to 3 children) £38/£42. Advance discounted tickets are available from the Museum Shop or from www.brooklandsmuseum.com. Dance Classes are included in the entry price. The Concorde Experience is £5 for adults, £3 for children. Rides in the 4D Theatre are £4 for adults, £2 for children. The Royal Air Force Museum is proud to announce that its visitor figures enjoyed substantial growth on the back of a major redevelopment of its London site and a re-invigorated public events programme for the RAF Centenary at both its London and Cosford sites. In total, 989,593 people visited the RAF Museum from 1 April 2018 – 31 March 2019. This represents a spectacular growth of 39% on the previous year’s figures. The Museum’s London site recorded 544,628 visitors, up an unparalleled 59% on the previous year, while its site at Cosford in the West Midlands welcomed 444,965 visitors, a leap of 20%. “This growth is a fabulous response to the huge investment that the Museum made in the redevelopment of our London site in 2018 and a reflection on the public’s support for the RAF during the UK’s commemorations of the RAF Centenary. It also reflects how the Museum’s new vision of inspiring everyone with the RAF story – the people who shape it and its place in our lives – has struck a resonant chord with both our longstanding visitors and those new to the Museum. This was achieved by sharing RAF stories through our collections in new immersive ways, with inspiring exhibitions, in landscaping that recalls our aviation heritage, and across our fabulous event and activity programmes. I should like to take this opportunity to thank all our funders, in particular the National Lottery Heritage Fund, BAE Systems, the State of Kuwait and the Libor Fund, whose major contributions ensured this success, as well as each member of our team who contributed so much passion and hard work to ensure that the Museum enjoyed its most successful year ever. The Royal Air Force Museum is open daily from 10.00am. Admission is free. 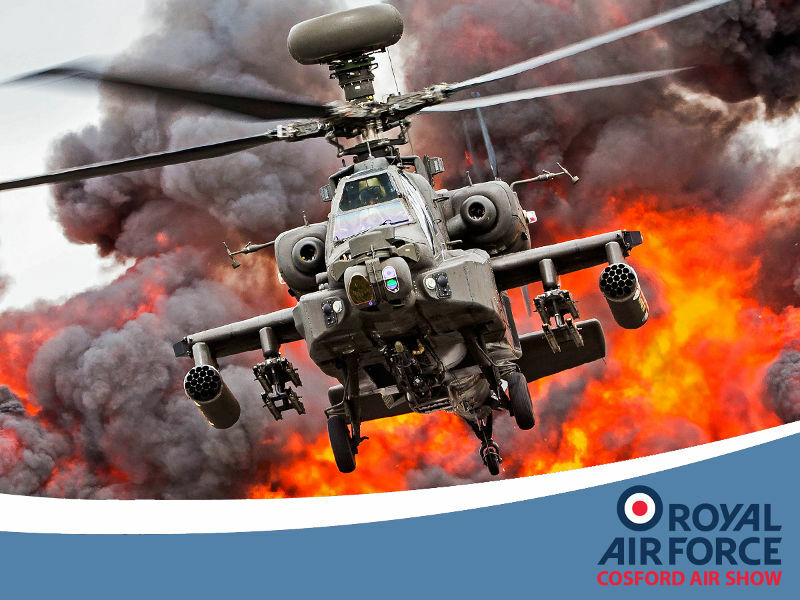 The RAF Cosford Air Show announced exciting news today that the Attack Helicopter Display Team will be returning on Sunday 9th June, with their explosive display showcasing the Apache gunship helicopter. The Apache is the Army Air Corps’ primary attack helicopter and its display, accompanied by ground-based pyrotechnics, is always one of the crowd favourites at the Air Show. Today, organisers also confirmed an assortment of other helicopters for static display: The Royal Air Force will send a Puma HC2 troop transportation helicopter, the Royal Navy will showcase their Merlin HM2 submarine hunter and the Midlands Air Ambulance Charity will exhibit their newest H145 life-saving helicopter. The Royal Air Force Museum Cosford will be opening the doors to thirteen aircraft from its collection during a two day Open Cockpits Weekend on Saturday 22 and Sunday 23 June. 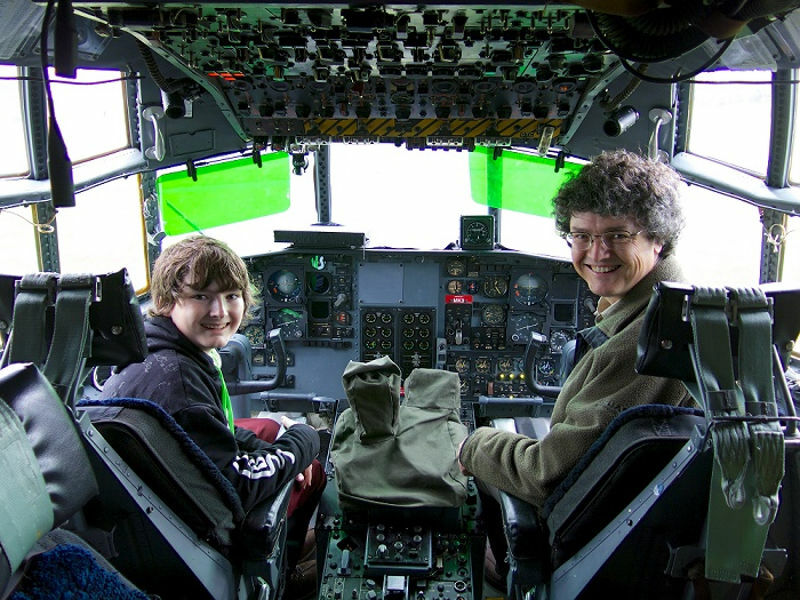 It’s the perfect opportunity for aviation fans and families with budding young pilots to get a closer look inside some of the historic aircraft on display and take to the flying controls whilst sitting in the pilot’s seat. Just 300 spaces per day are available for this exciting event which gives ticket holders up to six hours to explore everything from jet fighters to airliners, including aircraft from British, American and Russian Air Forces. 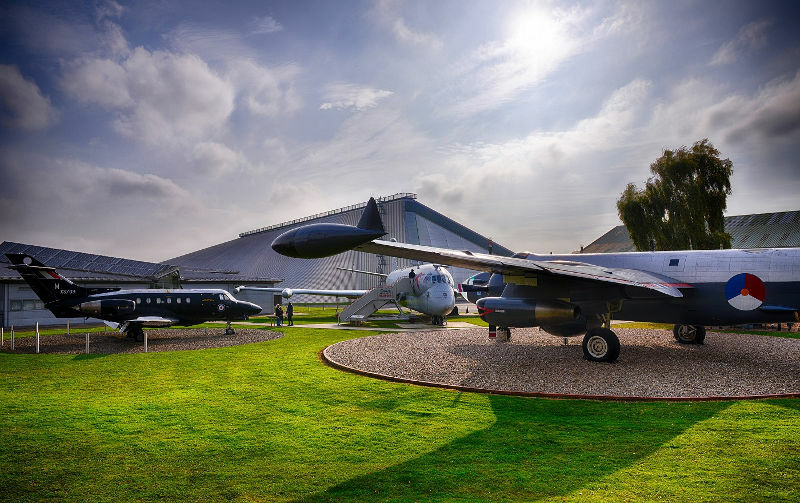 The June event at Cosford will be themed around the Museum’s National Cold War Exhibition, the transport and training collection in Hangar 1 and a selection of aircraft outside in the Museum grounds. The popular Lockheed Hercules C130K Mk3 is guaranteed to be an event highlight. The C-130 Hercules has been a key component of the Royal Air Force’s frontline for over fifty years and continues to provide service to the present day. A familiar sight, at home and abroad, the Hercules can rightly claim to have been the ‘first in and last out’ in numerous campaigns and operations. As a tanker, and as transport, it has delivered vital strategic and tactical mobility – providing the platform for the Royal Air Force’s operational capabilities, through the Cold War and beyond. Ticket holders will also be able to step on board another RAF transporting giant, the Vickers VC10 during the special event. Designed as a long-range airliner able to operate from short runways at airfields in hot and high conditions, the VC10 had a high cruising mach number with very good short field performance. In the later part of its service the aircraft was modified for the tanking role but kept its passenger and freight carrying ability. This is the first time the VC10 will be opened to visitors using its new fully accessible boarding ramp, kindly donated to the Museum by local based aviation ground handling manufacturer, Aviramp. From the Cold War collection, aviation fans can take a seat inside the cockpit of the General Dynamics F-111 F-CF, a two-seat American fighter-bomber. The F-111A variant became the first variable-geometry combat aircraft to enter service, seeing extensive action during the Vietnam War. As well as serving with US forces, the F-111C variant were produced for the Royal Australian Air Force. The final production variant, the F-111F (as seen at Cosford) featured improved avionics, including navigational and digital computer systems, improved wing structure and landing gear, and more powerful engines. Their main offensive load was Paveway laser-guided bombs, with Sidewinder missiles carried for self-defence. A total of 106 were built from 1972 and they saw much service during the first Gulf War in 1991. Other Cold War aircraft that families will get the chance to climb on board and explore during the Open Cockpits Weekend include the Short Brothers Belfast, Handley Page Hastings, Avro York C1, and the Mikoyan-Gurevich MiG 21PF (close view only). Head down to Hangar 1 and you will find the Museum’s transport and training aircraft, used for moving troops and equipment and retained to teach aircrews the wide variety of skills they must master before becoming operational. Aircraft from this collection open during the June event will include the Vickers Varsity T Mk I, brought into RAF service in 1951 for crew training as a replacement for the Wellington T10. 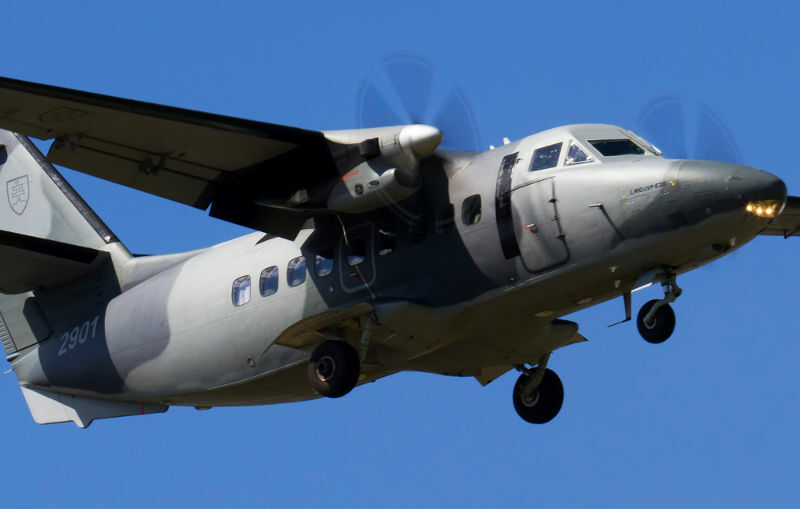 Aviation fans will also have the rare opportunity to step inside the Hawker Siddeley Andover E3A, a short take-off and landing transport aircraft that operated in trooping, paratrooping, airdropping, freighting and casevac roles. Plus, the de Havilland Devon, Hunting Percival Pembroke C1 and the Junkers Ju52/3M will also be included in the aircraft line-up. The final aircraft in the event programme is the advanced navigation trainer, Scottish Aviation Jetstream T Mk1 which will be featured outside with the hangar backdrop. Access to all the external aircraft will be weather permitting. A total of 300 tickets per day are available for the event on Saturday 22 and Sunday 23 June and aviation fans will have up to six hours to enjoy the exclusive access. Tickets are now available to purchase through the Museum’s website www.rafmuseum.org/cosford and cost £13.50 per person which includes parking (minimum height restrictions apply 1.07m). Ticket holder will also receive a 10% discount on purchases made in the Museum shop during the Open Cockpits Weekend. Entry to the Museum is free of charge. As part of the European Space Agency (ESA), Tim was the first British ESA astronaut to visit the International Space Station, launching on a Soyuz rocket in December 2015 and returning to earth six months later having taken part in a variety of activities including conducting a spacewalk to repair the Station’s power supply. If that isn’t enough, visitors on the Friday will find themselves under the ‘microscope’ as Airbus DS’s Pleiades satellites flies over RAF Fairford taking a photo of the airshow as it orbits the earth. RAF Fairford, which is celebrating its 75th anniversary this year, was NASA’s only UK transatlantic abort landing site for the Space Shuttle and in 1983 hosted a visit by the spacecraft which was secured on the back of a jumbo jet bound for the Paris Air Show. 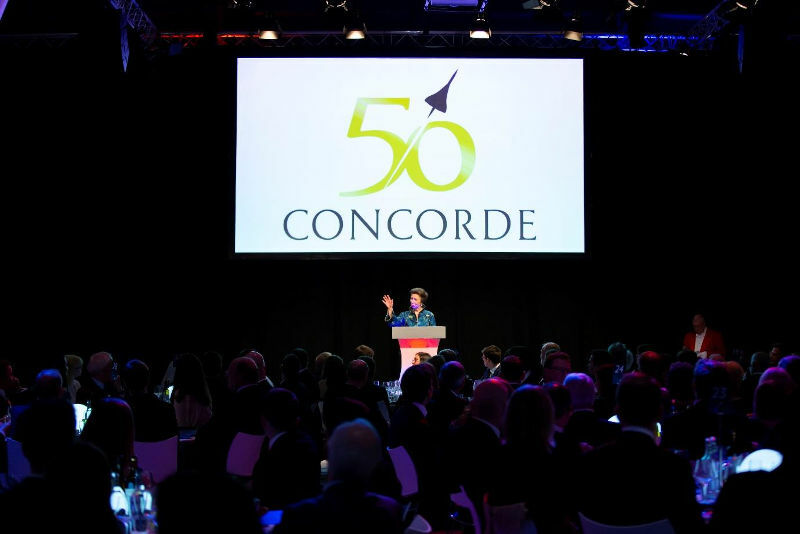 Filton, Bristol, April 9, 2019: Today marks 50 years since the first test flight of a British-made Concorde was completed – flying from Filton Airport to RAF Fairford in Gloucestershire, a journey taking just 22 minutes but changing the course of aviation history. To celebrate the anniversary, Aerospace Bristol – the museum that is now home to the last Concorde ever to fly – and the Fleet Air Arm Museum – home to Concorde 002, which first took to the skies 50 years ago today – teamed up to organise a nostalgic journey across the West Country. Over 150 people visited Concorde Alpha Foxtrot at Aerospace Bristol this morning, before boarding Bristol Buses and Cars and travelling to Yeovilton, where they visited Concorde 002. The two museums give visitors the opportunity to discover more about the world’s most famous aircraft, from the people behind its initial forays to the edge of space and record-breaking speeds, to the experience for passengers and even the food served on-board. 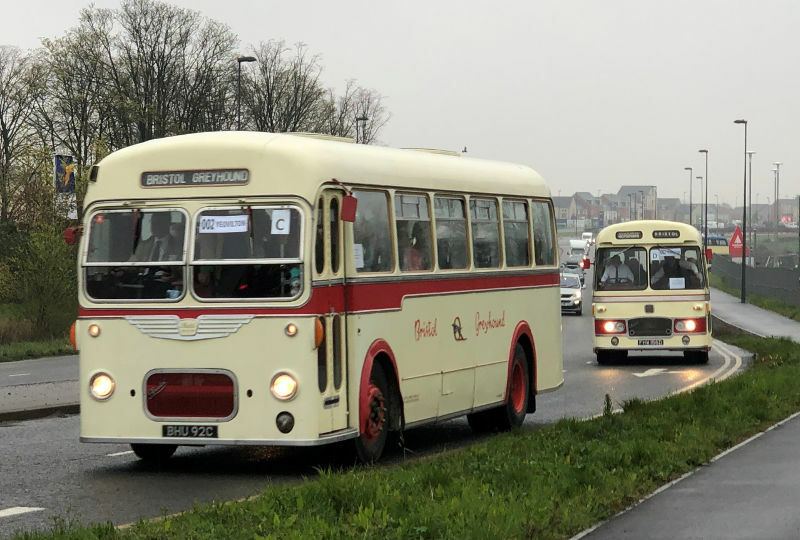 Aerospace Bristol tells the story of Bristol’s aviation and engineering heritage – from the first powered flights through to the modern day – including how Bristol diversified into the automobile industry and produced the cars and buses that formed the cavalcade today.